I’ve been listening to Joe Duffy’s ‘Liveline’ on RTÉ Radio One. 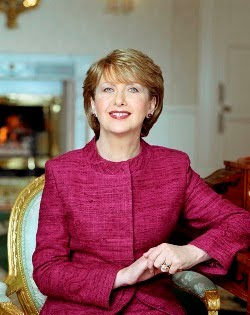 All this week Joe’s show is based in Áras an Uachtaráin, with President Mary McAleese leading the charge to try and awake optimism among all those Irish people who are suffering seriously from the recession. Now I’ll yield to no one in my admiration for Mary the Second. I’ve met her and in fact worked with her on a TV programme about Queen’s University, when she worked there. She’s highly intelligent, highly articulate and, as far as I could tell, highly moral in all her dealings, including how she treats every single person she encounters. And I think it’s a very good idea to try to ignite a positive mood in the twenty-six counties: if you think you can’t do anything to improve your situation, you won’t. But (you knew there was a But coming, didn’t you?) it’s got to have a practical edge, otherwise it may plunge people even more deeply into despair. When I was listening to the programme, the most notable speaker was a young guy from the North who had found himself going blind and responded by training for and eventually going to the South Pole. This was held up as a model for the rest of the population, especially those in a state of economic distress . If he can pick his life up and make progress, so can you. Good intentions but I kept putting myself in the shoes of some poor punter who’s lost his job and is sinking under the weight of it all. Would he be saying to himself “Fantastic – since hearing that blind guy, I’m inspired to go out there and get me a job!” Or is he more likely to say “What the ****’s that guy going to the South Pole got to do with me trying to get a job for which there are 500 other applicants?” Alas, I suspect the latter. Motivational sessions are fine but only if they end in some practical advice or provide an example of good practice IN A SITUATION RESEMBLING YOUR OWN. Surely a smart woman like Mary knows that? That said, as they say, she has a lovely speaking voice.